Coleman Observatory has been closed until further notice. We are in the process of relocating Coleman Observatory. More details will be forthcoming soon. Thank You! Thank You for inquiring about Coleman Observatory! Our permanent observing site is located 8 miles NW of Van Buren, AR. 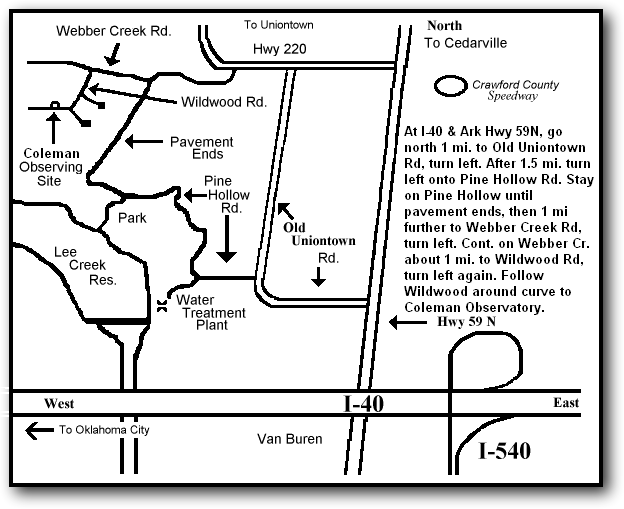 The written directions on the map below are accurate and should be followed carefully. We also have signs up at the last three intersections to assist visitors in reaching the site with as much ease as possible. Be advised that the road is dirt for the final 2 miles and is often rough. The grounds at Coleman Observatory are open for everyone to use at any time. You do not need to be a member of the Arkansas Oklahoma Astronomical Society to enjoy the dark skies from our observatory. If you have a telescope and would like a good, dark observing site, you are welcome anytime. Visitors who would like to schedule guided tours of the night sky from Coleman Observatory should contact the caretaker at least 24-48 hours in advance to set up an observing session. There are no costs for this service, but we hope that people will consider making a donation to AOAS/Coleman Observatory. All monies given to AOAS may be considered charitable donations and are tax-deductible. AOAS is a registered 501-(c)-3 non-profit organization. Alternatively, visitors may purchase a club t-shirt at $12/ea in a wide variety of sizes and colors. Members of AOAS are allowed to use the 13” Dobsonian telescope located at the observatory grounds in its 10’-by-10’ roll-off roof building. Contact the caretaker for the keys to the building and for eyepieces. All buildings are kept locked unless notification is given prior to use. Contact the caretaker by email at least 48 hrs in advance at caretaker@aoas.org. Or, you may call (479) 474-4740 at least 24 hrs in advance to schedule guided tours of our universe. Geographic (GPS) Coordinates for Common AOAS Localities can be found here. We hope everyone enjoys their visit to AOAS’ Coleman Observatory!